As a personal response to the Tucson events of January 8th, 2011, I have designed a glass, crystal and sterling necklace in a bolo tie style. The beads have a permanent finish, and the sterling concho is crafted by Contreras Fine Arts, a local gallery. Each sale will benefit the Fund for Civility,through the Community Foundation of Southern Arizona. $ 250 . Limited Edition of 100. Signed and Numbered. Custom Order Only. Inspiration: The sunrise to the east from Sentinel Peak. 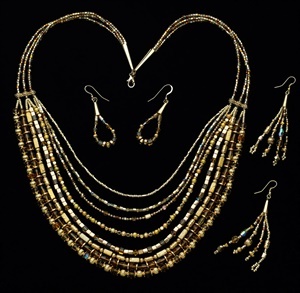 Multi-strand necklace with 10 graduated strands in gold, brass, and amber beads.Total length of longest strand is 30" finished with cones and lobster clasp. 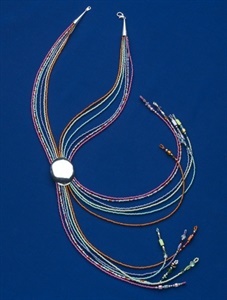 Materials include bicone, diamond- and round-cut crystals, opaque gold and crystal cubes, Miyuki and Spectra glass beads,filigree spacers,and fire-polish crystals strung on coated wire. Earrings are designed using gold-filled earwires, but are also offered in sterling or clip-on styles. Additional earring styles available. INCLUDES USPS SHIPPING. Inspiration: The Copper Queen mine in Bisbee,Arizona. 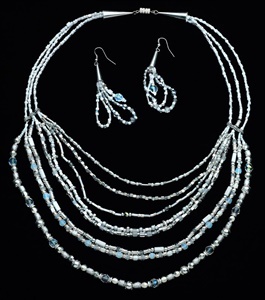 This patterned necklace consists of ten graduated strands of copper beads, Japanese Delicas, native American heishe, and 35 matched freshwater pearls,with strands from 20"-25" long. The work is strung on coated wire, and finished with embellished pure copper cones. 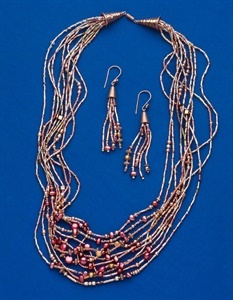 The 3-strand 2.5" earrings are made up of copper and brass beads, bugles,and pearls.Each set is finished with copper cones and french hooks. Gold-filled or sterling ear wires also available. Inspiration:Clouds backlit by the moon after a monsoon. A "lunar" version of Sonoran Sunrise. Designed in sterling, moonstones,milk glass and crystal. Each set is finished with sterling cones and ear wires. 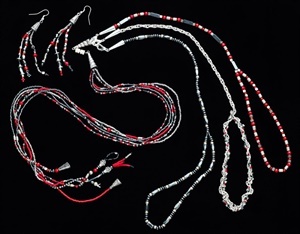 Lariat -style design made up of sterling, hematite, coral and beads. The lariat chains are interchangeable...you can wear any one,two or all three at once! As the daughter and sister of succesful graphic artists/designers, my earliest memories are of exposure to art, color and form. As a student, I took every art course offered, and have sampled many different mediums of expression as my senses and skills matured. Although I grew up in New England, I have had a lifelong love affair with the Southwest. My interest in Hispanic culture and traditions led to a year's residency in San Miguel Allende, Guanajuato, Mexico , studying jewelry design and mural painting. I moved to Tucson following that immersion, and found both the surroundings and the community that were then, and are now, the ideal place for me. My appreciation for the light, color and physical characteristics of the southwest desert has inspired me to manifest art in my daily life. Many of my creations have origins in my nature photographs.... even after more than forty years within Tucson, I still discover new visual images that spark my creativity as a craftsman. Content copyright by Dallas Josephy.